Besides all of the organized events, there are famous brewing people to meet and things to see. 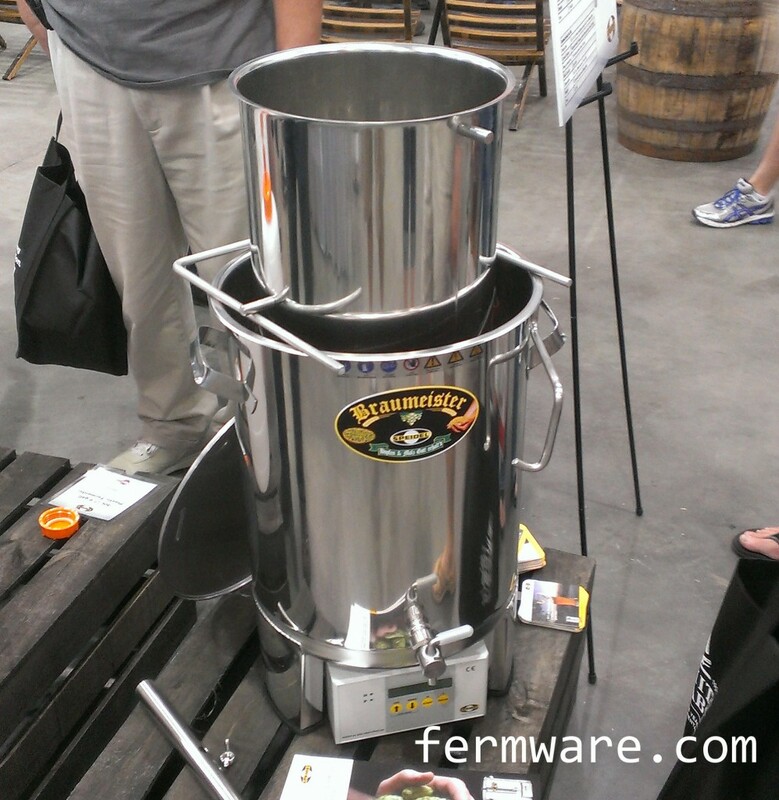 I got to meet James Spencer (Basic Brewing Radio) and “Toxicologist Paul” whom I had communicated with via email about my technique of using Fermentation Bucket Liners for my fermenting. I saw their sidekick Steve, but he was being mobbed by beer groupies, so I didn’t get to talk to him. I also ran into Denny Conn, who was very approachable and didn’t seem the least bothered that I wanted to talk to him. I had kind of a Coming to America moment when I met Brad Smith (BeerSmith brewing software) in the men’s restroom. Sorry, no YouTube clip available. I was also pleasantly surprised to see Anita, Bill, Tom and Bryan from my LHBS Great Fermentations. You guys are awesome! I met the water wiz Martin Brungard, creator of the very capable brewing water calculation spreadsheet Bru’n Water. Funny thing is, he lives in the next town over from me, but I had to travel to Grand Rapids to meet him. 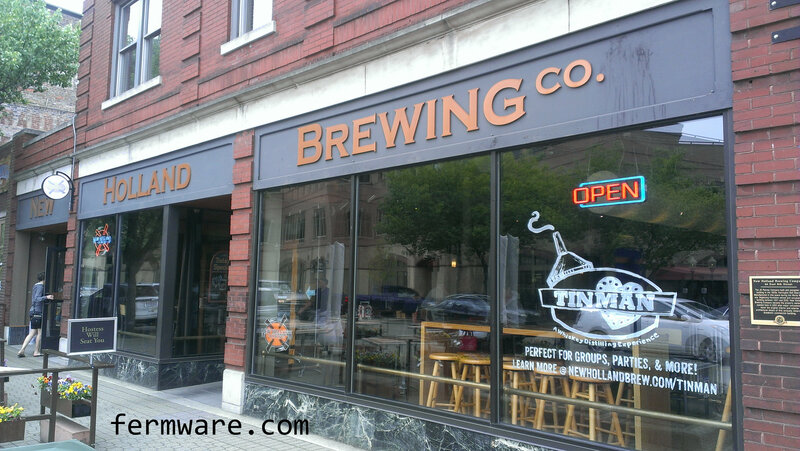 On the drive up, we stopped in Holland Michigan to have lunch and sample a few beers at New Holland Brewing. Unfortunately, with so much going on and us not being able to go up any earlier, we did not get to visit Bell’s or Founders. Fortunately, they crafted some special brews for us attendees. And you also get to come away with all sorts of swag. I’m not sure I will be able to make the trek out to San Deigo, but I’m hopeful that NHC will at some point make a stop in Indianapolis. While maybe not nationally known for beer, Indiana is home to about 100 breweries and counting by the day it seems. 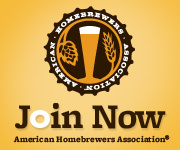 If you are not yet a member of the American Homebrewers Association, I highly suggest you become a member. 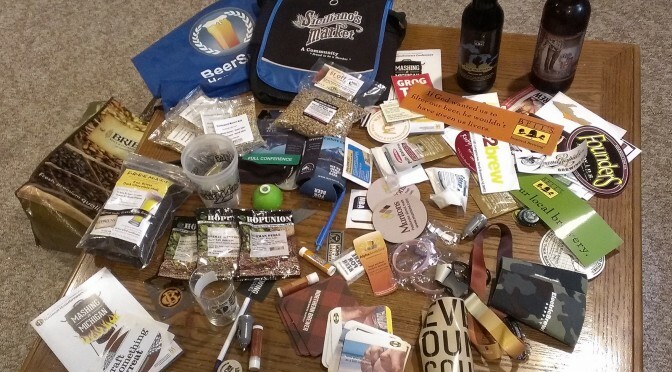 You don’t have to attend rallies, enter every beer you think is great into competitions or have a dedicated brewing shed to take advantage of all of the perks of being a member. Ok, so this is REALLY what I came for. You know I’m an equipment geek, so it was cool to see all the latest stuff. In no particular order, here is my list of the coolest things I saw. Missed my first post on my thoughts of the evening events? Go back to the beginning.. This might be slightly more difficult to read than most, because your inner brew geek mind will easily wander into thinking about what you can buy or make next. This is like the countertop kegerator. And the thing is, that isn’t the coolest thing about the SYNEK. What is so cool, is that they have brought focus to a new way to package beer. The best way to describe it is like box wine. If you’ve ever bought some and taken apart the box to find the bag inside, you’ll know what I’m talking about. I’m not ashamed to say that I still do buy it, because there actually is good box wine. I’m an ultra-beersnob, but I’m fine with the Two Buck Chuck (or Three Buck, depending on where you live). Anyway, back on subject. 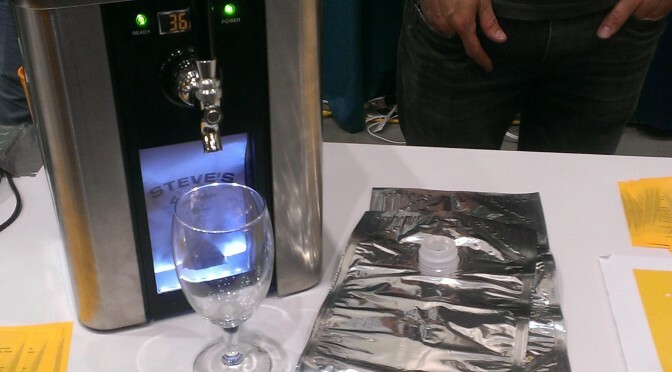 The premise is that anyone from homebrewers on up to professional breweries will be able to use the new packaging. It’s one of those ideas that was waiting to happen, since all the technology was there. I like the fact that with growlers, you can go to most any brewery and bring home the deliciousness. The bad thing is that once you open them, you need to drink the beer within a few days or it goes flat. Unless you are using some sort of carbonation cap (I’ve got a method, which I’ll have a post on soon). In any case, glass is not an ideal material for holding pressure. I talked for a while with Steve Young, the founder for quite a while. He’s the guy in the videos on their site. You really have to watch the videos at the SYNEK Kickstarter page. It can do more justice than me writing about it. I myself am planning on acquiring an early unit to run it through it’s paces. For purely scientific reasons…. So a few plastic keg manufacturers have come to market with mixed reception. What I think is so great about this one is that they have a removable liner, so it makes cleanup a snap. This will have huge implications for commercial breweries. NOBODY likes cleaning. I had this idea when I decided to go with the Fermentation Bucket Liners, but hadn’t thought all the way through how to do it with a corny keg, so I’m glad to see that somebody has done it with normal kegs at least. Currently, the only fittings available are for a Sanke keg connector. They are supposed to be slightly larger in diameter than a standard sixth-barrel or corny keg. Visit their site to get more info. Not necessarily new, but my first time seeing it in person. I have to say, it is quite beautiful. It’s like the Porsche of brewing equipment. Appropriate, since they are headquartered in Ofterdingen Germany, not too far from Stuttgart, Germany, home of Porsche. If you have the means, I highly recommend picking one up. Until NHC, I hadn’t used their products or website. I had just seen their nice advertisements in Zymurgy. I got a few hop samples and intend to use one for my 1 gallon brewing experiment (in process). Their website has a ton of resources applicable to the homebrewer. You MUST go to their site and find out all you didn’t know about hops already. What’s so new with White Labs? They’ve been around. Ok, well besides what I think is a cool application of genetic mapping technology to study the yeast family tree. And in case you were wondering, as with the traditional vials, if you collect 5,000 empty FlexCell packages, Chris White will come to your house. Start saving!! So I keg and don’t filter my beer. I use a combination of patience and not necessarily caring what my beer looks like. OK, so when I do get to that point in the keg where my beer is crystal clear, I do feel pretty pleased with myself. 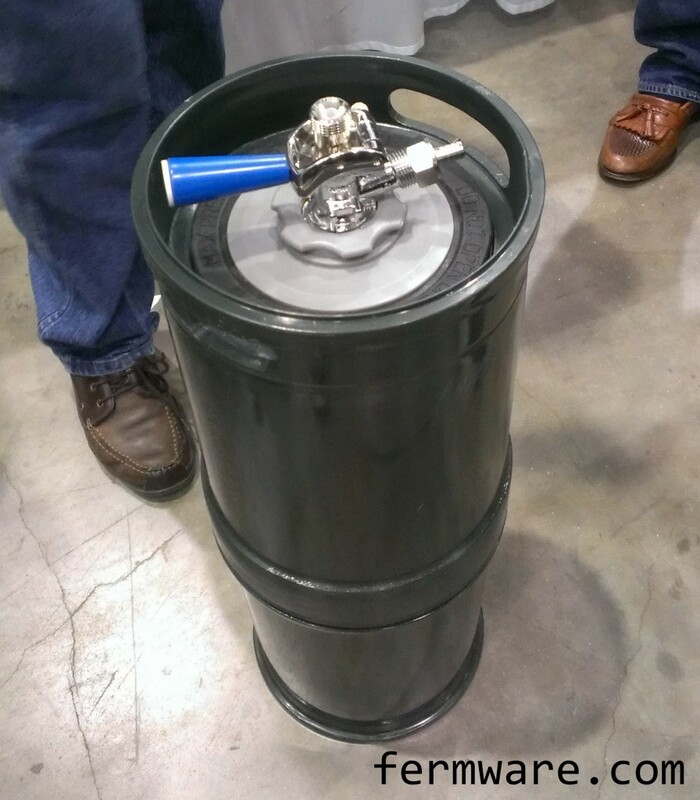 What we have here is an invention that allows you to pull beer from the top of the keg, instead of at the bottom. It’s basically a floating siphon. When I saw it, I thought “I wish I had invented that!”. I must acquire one and try it out. Ok, so I don’t bottle. Why do I care? It’s not just bottle labels, but keg/carboy labels, coasters, bottle caps and more. I hadn’t realized this before visiting their booth at the expo. I currently use gaffer’s tape on my fermenting buckets and then keep the same label all the way to the keg, but I do like the keg/carboy labels. And since my bottle labeling consists of a handwritten Sharpie label, it might be handy to have some real bottle labels made up. What else is cool about the bottle labels is that they are re-usable. As a test, I even ran my NHC tasting glass through the dishwasher with their sample label and it came out just fine. Click on my link below for 10% off. First off, thanks for the free wireless at NHC! 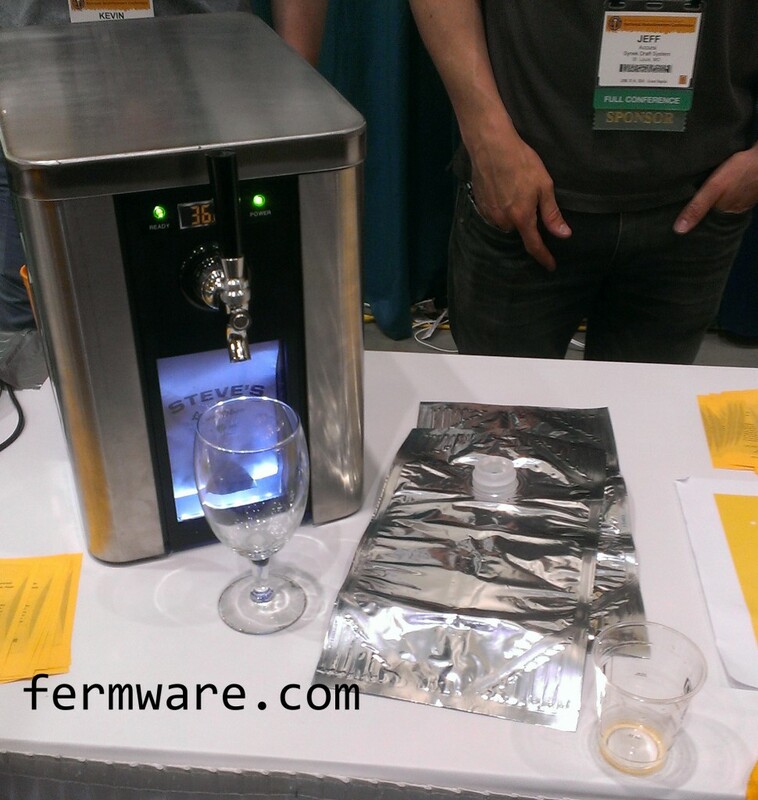 Another brewing software has entered the market. I talked to the developer of Brew Toad at the expo. While it doesn’t yet support special tools for BIAB, I will wait for it to mature a little and then include them in a future comparison of brewing software. I currently use BeerSmith, but I know things are moving the way of web based so you can have your information anywhere you have an internet connection, so we’ll see how this turns out. Congratulations to Kevin Torok. He is the winner of the $25 Amazon.com gift card! Click here to read my thoughts on our first NHC. Note: The contest for the Amazon.com gift card is over. Keep reading for a chance to win an Amazon.com gift card. 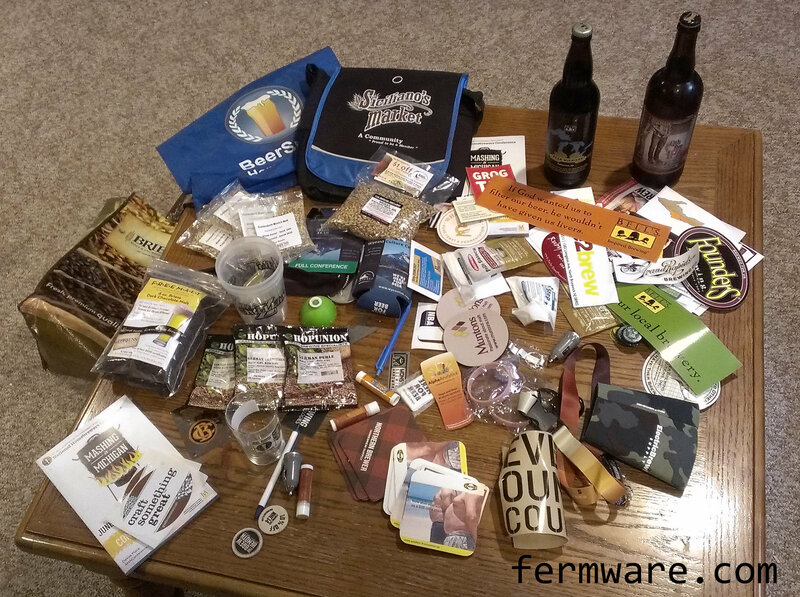 My wife and I are really excited to attend our first American Homebrewers Association National Homebrewers Conference this week in Grand Rapids Michigan. 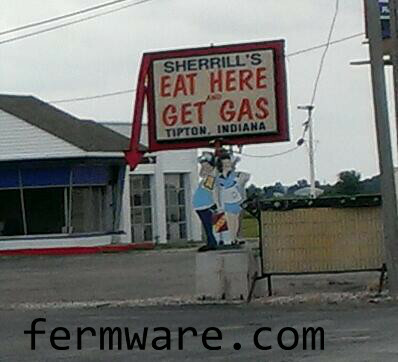 We’ll be sporting red and blue fermware.com shirts, so if you see us, please stop us and say hi. We hope to make some new friends and hopefully others that we can work with on some future DIY’s and R&D projects I’ve been working on. We don’t have a minute-by-minute schedule laid out yet (very unlike me). Besides checking out the latest and greatest brewing equipment and gadgets, we plan on attending some seminars, going to each evening’s events and doing some outside activities like taking a bike ride in the Heritage Hill District and visiting some of the local breweries. 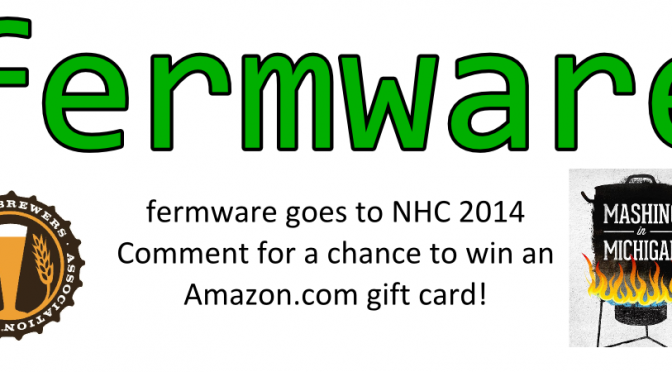 For a chance to win a $25 Amazon.com gift card, all you need to do is to make a comment on this post about your favorite piece(s) of equipment you saw at NHC or a piece of equipment you would like to learn more about or how to make yourself. If you didn’t make it to NHC 2014 or you just like the site, please feel free to comment anyway and get entered. While you are here, go ahead and check out some other posts or do some shopping at Amazon.com through links on this site to keep us going. As always, don’t worry, your purchases are anonymous, so don’t worry, I won’t come to your house asking to borrow your Chuck Norris Facts book. Actually, I already own it and it makes me laugh every time I open it. Those jokes never get old. Entry period will be from the time this post goes live until 11:59 PM EST on Monday, June 23rd, 2014. Winner will be announced on this post by 11:59 PM EST on Tuesday, June 24th, 2014. Entries/comments will only be used for this contest and will not be added to any mailing lists or passed on to any third parties.